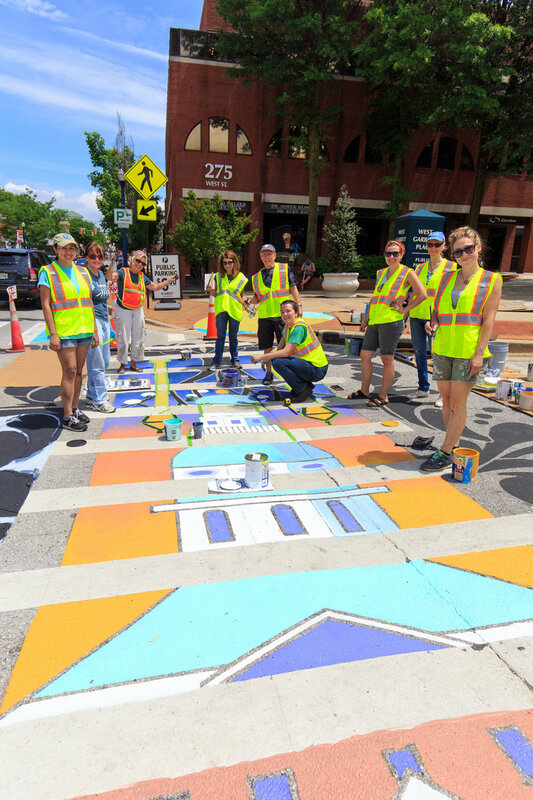 many entities throughout Annapolis, ArtWalk initiated the first in a series of artistically painted crosswalks to encourage walkability throughout the city. Starting at the gateway to the Arts District, this art installation brings motorists' attention to pedestrians crossing this busy intersection, while beautifying the neighborhood. With creative input from teachers Mary Rosoff, Jean Orzech, (above) and the students of Studio 39, lead designer Sally Comport incorporated their concepts into a cohesive, vibrant piece while also spotlighting premier artists in the community. Patrice Drago of Maryland Hall, Charles Lawrance of FinArt (below), as well as Comport herself painted original designs within the entryway circles to the crossings. The City of Annapolis Public Works fully supported this effort through planning and safety directives. Planted flower pots were donated by Homestead Gardens and painted by Studio 39. The project was presented to and blessed by the Art in Public Places Commission. Anna Quandt | Raven Reyes | Stephanie Baker | the inspiring Mary Rosoff & Jean Orzech of Studio 39 | Charles Walsh, ARTWALK | Sally Wern Comport & Lindsay Lowery, Art at Large, Inc.
A special thank you to Jessie Burneston of Public Works for waking up at 2am! and standing by us every moment of the three-day on-site process to ensure our safety, as well as all the coordination and planning leading up to installation. Thank you to David Jarrell and Lisa Greico for working with us enthusiastically to make this concept a reality. Thank you to our neighbors who shared their excitement, words of encouragement, and refreshments to beat the heat! Joyce Wearstler | Fado Annapolis | Kurt Hornig | Murray & Presidents Hill neighborhood | & more! Thank you to Annapolis Discovered for this great video footage! Find out how you can Help make the next crosswalk happen.